Note: as usual, new version will appear in automatic updates within a week or so. So, what's new, what's changed, and what's fixed. In FastRawiViewer 1.3, we made the decision (in the interest of not bamboozling users) to separate the hotkeys/menu options in cases of individual work with single files and group work with groups of selected files. In this case, the context menus worked as expected: the one in the main window of the application always worked with the current file, the Grid/Filmstrip one depended on whether or not the file belonged to a set of "selected" files (back then the operation was for groups) or not. This behavior was chosen so as to not startle existing users. However, this was somewhat unusual and not convenient for everyone, so starting from version 1.4.4 we are going to (gradually) unify these menu option/hotkey sets. This new functionality can be turned on through Preferences -> Grid & Filmstrip -> Single file keys work for multiple files too (see arrow 1 at the picture below). Both - the current file is implicitly added to the selected group. Menu -> Select/Batch is renamed to Menu -> Select, and all of the actions (copy/move/etc.) are removed from it, only work with selected is left. In Single-file View Mode, the actions always work with the current file, not the group. If the current file isn't in the group of selected files, but the setting If the current file... is set to Selected group or Both. File: Move, Copy, "Move to Rejected", Run - instead of the filename, you will see "Move (Copy, Pass to) NN files to"
Adjust: the header "Rotate NN selected files" appears above the Rotate group; and "Adjust filename" above the edit single file (In Single file View Mode) group. If the selected group has identical ratings/labels, then the corresponding snowflakes/borders will be highlighted, if they're non-identical (or unknown, see the next point), then they won't be. If for part of the files, the metadata hasn't been read yet, then if there are fewer than 30 such files, they will be read. If there are more, then the "common rating/common label" will be unknown. If, when working with a group of files, with the setting XMP -> Disable batch XMP operations if files with same name are selected turned on (default value), then if in the group of selected files there are files with identical names (for example file.CR2 and file.DNG), then XMP operations (rotation, rating, label, title, description) will be restricted (in fact, disabled). In the header of the XMP Metadata panel (XMP Change disabled), and textually in place of the Title/Description fields. The check for one button is assigned to several actions that happens at the start of the application. 1.4.4 release - turned off; after the update, nothing will change for both new and existing users (unless 1.4.4-beta was installed with this setting is on). 1.4.5 - turned on (with the setting inherited from 1.4.4): new users will get the new behaviors, while previous users who updated in time will get the existing behavior. Furthermore, we have standard selection model planned for in version 1.4.5 (this is when an accidental click in the Grid/Filmstrip deletes a lovingly-crafted selection). If you shoot with bracketing (often), you may find it useful to to move left/right through a list of files by more than one file at a time. This function can be turned on with the EnableLargeJumps.reg(sh) script (and turned of through the DisableLargeJumps script). 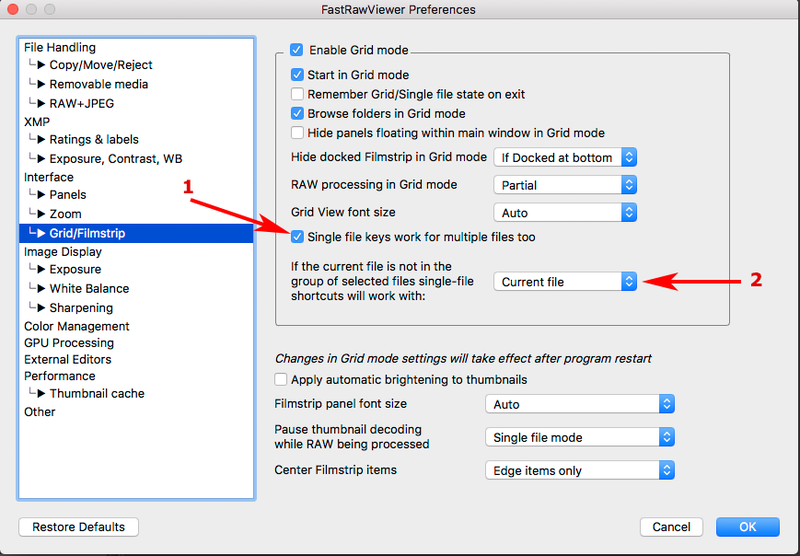 As to how to use the scripts, please, refer to the FastRawViewer manual. When this is turned on, the Menu adds the items Menu -> File -> Jump +2 files (+3 files, -2 files, -3 files) and default hotkeys: Ctrl-Alt-RightArrow (move +2), Ctrl-Shift-Alt-RightArrow (+3) and similar for left arrow to move -2/-3. The size of the jump can be controlled through the Registry/Defaults Large2JumpStep and Large3JumpStep settings. The EnableLargeJumps script sets these settings to 2 and 3, respectively. If you need other values (for example, your standard bracketing step is 3 and 5 shots), you will need to copy the script somewhere where it can be edited, change the values, and launch it (or change the values manually through Registry Editor/defaults). 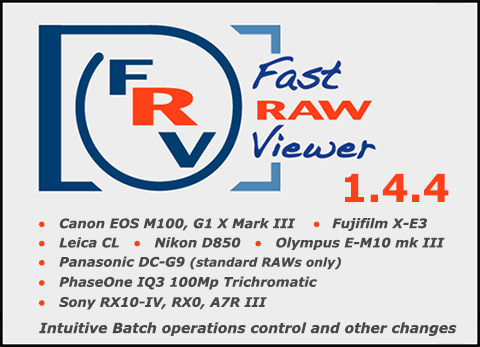 The changed values take place after FastRawViewer has been relaunched. If the step for "large steps" is set to 0, then the corresponding menu points/hotkeys are deactivated. 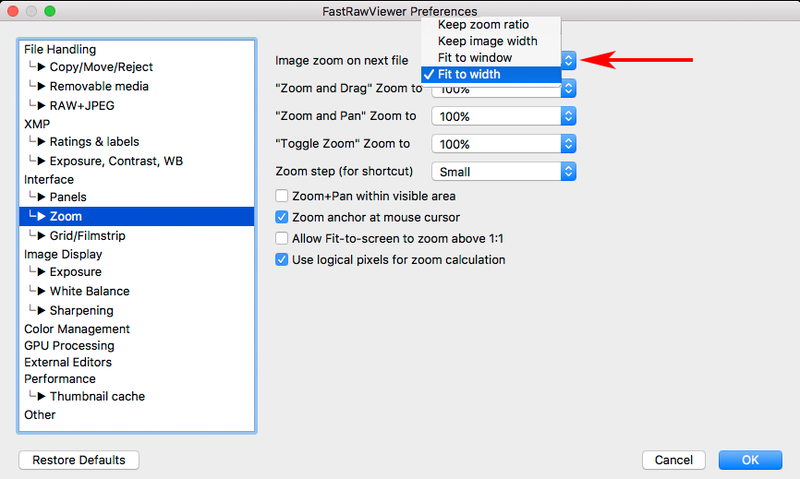 New setting added: Preferences -> Interface -> Zoom -> Image zoom on next file -> Fit Width. Because, when setting an unfortunate window size, it was possible to have a "cycle" (Fit to width - the vertical scrollbar appear - width decreases - one needs to reduce the scale - the scrollbar disappears - one can increase the size again), Fit-To-Width can leave the field of a width up to 10 pixels. 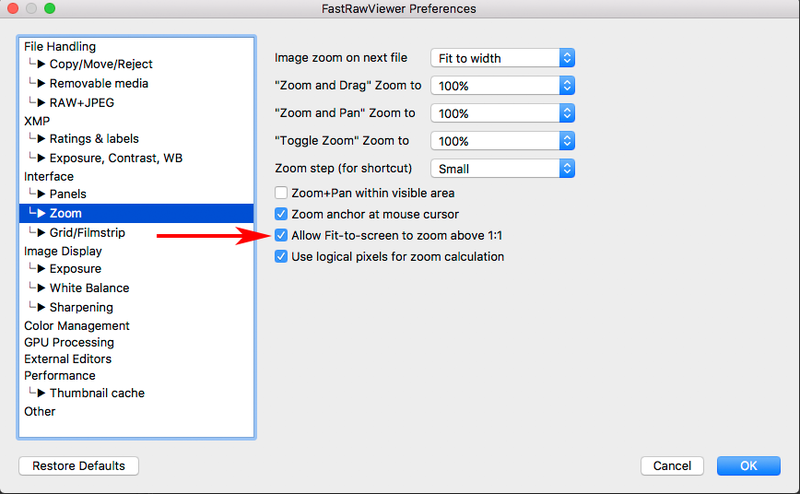 This allows one to set the zoom to be more than 100% in Fit to screen/Fit to width modes. This allows the application to, on start, recall that all panels were closed. 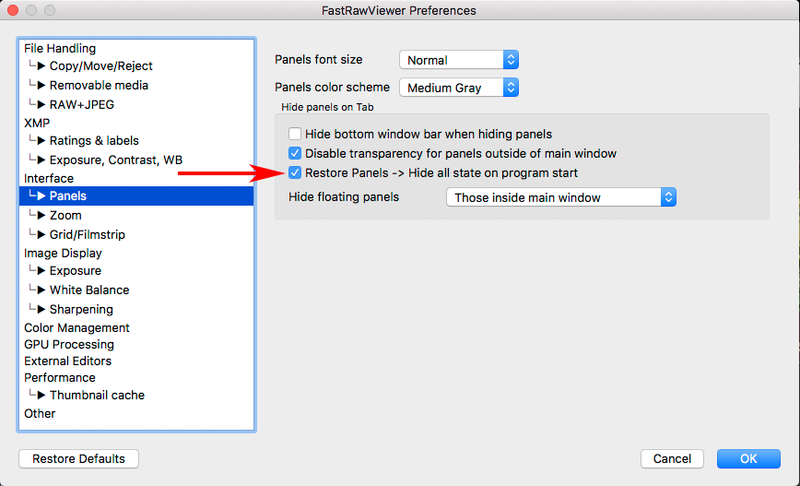 Attention: the setting Interface -> Force open Folders panel if started without filename activates AFTER Restore Panels -> Hide All. If you want to always start without panels, you will need to either explicitly close them all, or turn off Force open folders. Reading labels from XMP files has been reworked: if XMP Label Style: Custom is being used, and a word/string that is used in other styles for other colors is being used as a Custom label (for example, for the red label the word Green is used, which corresponds to the green label in the Lightroom Color labels style), then reading the file's label will take place correctly (first the word will be searched in a list of custom labels, and only then from a list of defaults). To do so, in Single File keys works for multiple files.. mode use the default menu (XMP Metadata), the default hotkey (Alt-D), the context menu for a file group, or by clicking on the Title/Description space in the XMP Metadata panel. If the new mode has been turned off, then group editing appears in the Select/Batch menu. If the checkbox isn't checked, then the corresponding field can't be edited and it won't be changed for file groups. 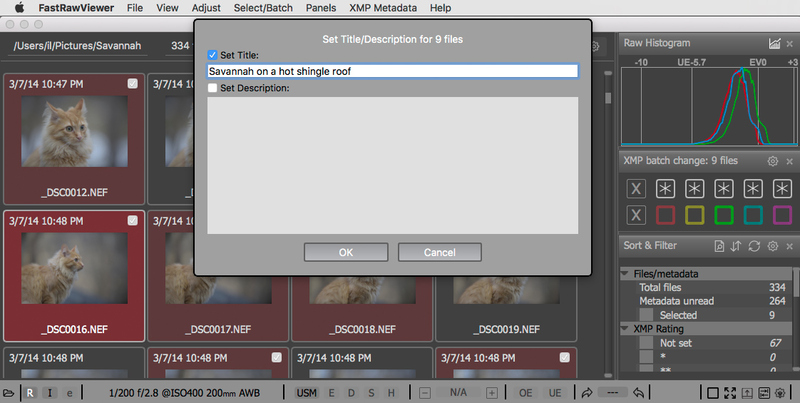 If a group of selected files has the same Title/Description, then they will be displayed in the editing dialog. If different, then it will say in the dialog (as a gray text in the editing panels) that the values are different. If this is turned on, then Menu -> File -> Refresh -> current folder will clear the cache of decoded files. Image Display: the Sharpening settings have been moved to a separate page. Separate diagnostic message when trying to write to a read-only file. 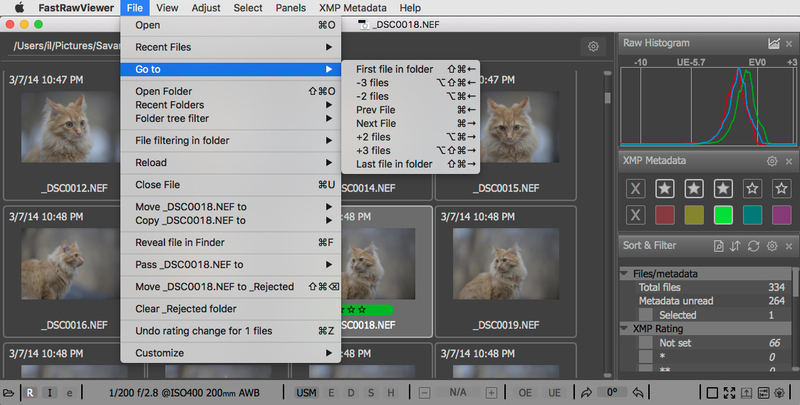 New setting for XMP: "Restore original JPEG file date after writing XMP block" - the original file modification data will be restored after writing an XMP block. New setting Image Display -> Exposure -> Use camera provided highlight limit: if this is turned on (default), then the maximum value of the RAW data will be taken from the metadata of the RAW file (works with Canon, Olympus, Sony, Panasonic, Samsung, Pentax, Kodak). Adobe Photoshop CC 2018 and Adobe Lightroom Classic CC have been added to the list of known applications. New action in the Select menu: Move to prev. and (de)select: this is the opposite of the existing Menu -> Select -> (De)Select and move to next action. Subsequent uses of (De)Select and move to next and Move to Prev. and (de)select will reset the selection to initial state. (De)Select and move to next - the default shortcut Shift-RightArrow has been added (in addition to the existing Ctrl-). Existing users, please note: the Shift-RightArrow will not automatically be added to existing keyboard shortcuts; you will need to either add it in manually through the shortcuts editor or reset the shortcut settings to the Defaults. When changing the current volume (Windows: disc letter, OS X: mount point), all of the monitoring to changes to other volumes is removed, allowing one to unmount a flash card which has been left not only through FastRawViewer, but also with the inherent mechanisms of the operating system. Undo: file selection is restored only after Move or Move to rejected undo, all other undo operations do not change selected files list. 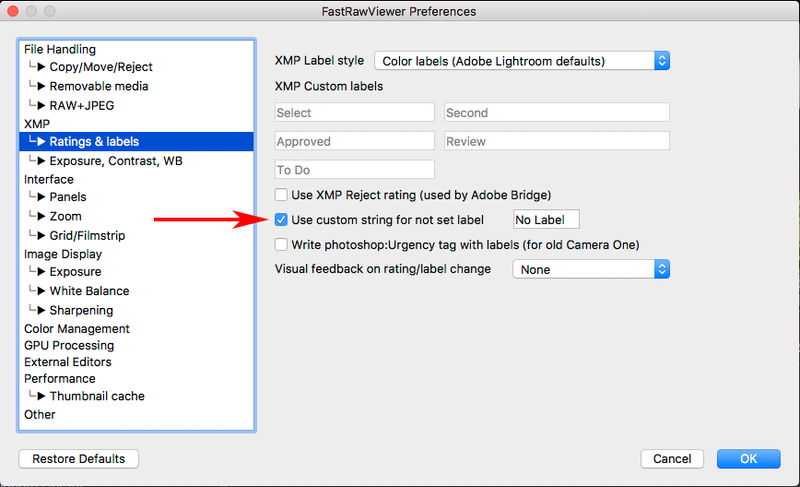 Recording XMP to JPEG: in a series of cases, EXIF data would be modified; no longer. Correct work with copy/move/reject with UNC paths. Correct work with copy/move/reject with symbolic links for UNC paths. Incorrect zoom setting has been fixed, it happened after the following sequence of events: manually setting the Zoom (not fit-to-screen) - switching to embedded JPEG (lower resolution) - moving to the next file with the default image to display: RAW. The Reset filtering on folder change setting was always on and wouldn't turn off. In some cases, when deleting/moving all filtered files, the filtering was lost. 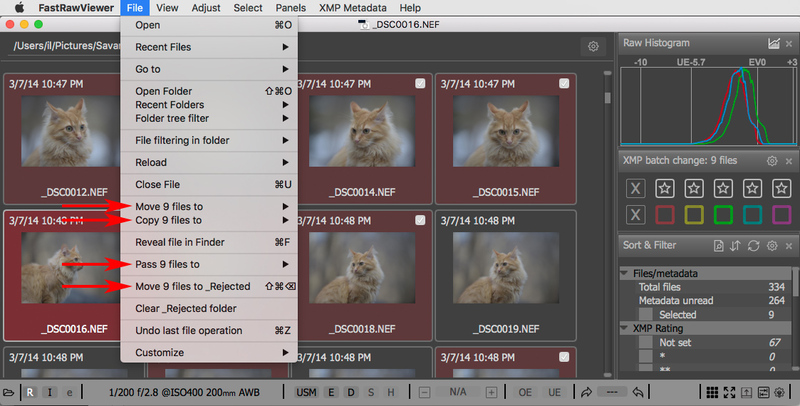 The Title/Description wouldn't update in the interior cache after editing and could be displayed incorrectly in the Grid (but not in the XMP Metadata Panel). When turning on sorting by metadata, the current file could randomly change in the process of filtration (during more metadata reading). The & symbol was displayed incorrectly in the hotkey settings dialog. The check for the image aspect ratio is now done more carefully/accurately. Work with black-and-white thumbnails has been improved. Color data for calculating CCT/Tint for the Panasonic LX100 camera has been fixed. The problem with coding in the help for keyboard macros has been fixed. If the use of XMP Rating Reject was turned on, Reject was after No rating in the menu/context menu (and before it in the XMP Metadata panel). Windows: on the first prefrernces save, graphics mode to be set to DirectX9 instead of determined automatically on the first run. Fixed memory leak in handling JPEG previews with orientation that not match RAW sensor orientation.